Back in February 2009 I first posted about Metro Thread (if you look under blogs you will see my post). I must say Metro has really grown and to see how many people like them is unbelievable. Its great to see how many people that love Metro Threads products. Metro has really done great with their website and I noticed that most of the people that commented on my blog about shipping rates – well now Metro indicates that the cost is up to 9.98 and if your order is $250 its free shipping. I believe that the shipping costs are very comparable considering the cost of these spool of threads. Today I was going to order some white thread from a competitor, however their prices where not as low as Metro. And well if I get my order in today the 17th of June, since they are on vacation, if I order $50 or more I’ll get 12% off the order. Metro Thread can be used on any embroidery machine as far as I can see. I know people are particular on what they use, but heck I gave them a whirl and well I have 7 or 8 boxes of their big king spools. What more can I say about Metro that many haven’t already said, great thread, wonderful sheen and great service, besides the COST! If you haven’t already checked out Metro Thread’s website, I think you should take a look and join them on your Facebook if you have an account. Also sign up for their newsletters. I have. You will be notified about special sales. Its worth it! Love how they have were you can post a comment right on the web-site or using your Facebook account. Thumbs up on that! Max and all the members of Metro – great job!!! Figured I would stop by Metro Embroidery Threads to see if they have a sale going on. Much to my surprise they have this “awesome” wood storage cabinet for their small spools of embroidery thread. The neat thing about this cabinet is that it keeps the embroidery thread clean and dry , as well as the other elements that can weaken embroidery threads, sun and heat. This item is on sale for 69.00 until supplies last, if you order the finished wood, cost is 10.00 more. 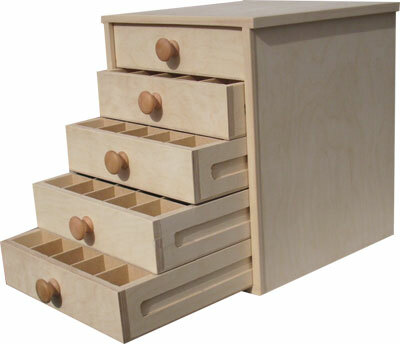 6 drawers, you can easily color coordinate your threads and everything will be organized at the tip of your fingers! What makes this cabinet so awesome is the size, 12 1/2 width, depth and the height is 14 inches. You have an option of either having it unfinished, thus you can paint it to match or decor OR you can order it for an extra charge for the natural wood finish. The cabinet only weighs 23 pounds, yes that is without the thread. You can even order the cabinet with thread! 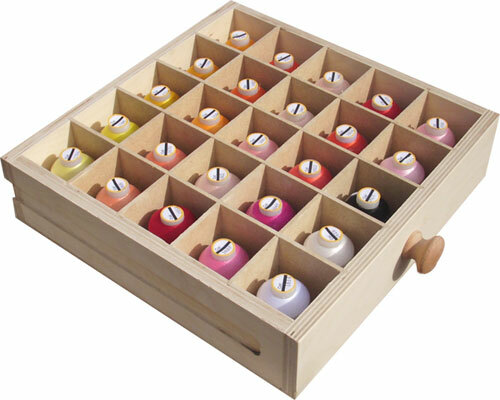 This cabinet holds 125 small spool threads, thats 25 spools in each drawer! Now how many of us have that amount of thread? I know I have more than that! The cabinet was specially designed to hold only Metro Embroidery thread, so if you have ordered previously from then, this is the item that should be on your Christmas list, heck Christmas, any occasion! However, each compartment size for each spool of thread is, 2W x 2D x 2 1/2 H, so you just might be able to use this item for other embroidery spools. So before you order make sure your non Metro Embroider Threads will fit in each cubby. This item usually retails at 129.00! You can’t go wrong with the sale price of 69.00 (natural color wood add 10.00). I wish they had something like this for the big spools. I like the snug compartments, you can see each color clearly. You can either put a piece of paper on the bottom of the drawer with the color number or on the back of each compartment so that if you have spools all over, you will know where to put the ones you’ve used. 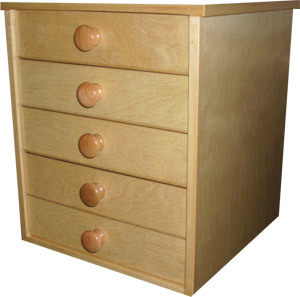 This cabinet is handmade in the USA. I see that Metro Embroidery now has two types of stabilizer as well. Tearaway and cutaway (soft) in 6 x 6 sheets. They are in the process of obtaining and selling 8 x 8 sheets. Check out the prices on their site. Currently they are on sale, half off, can’t go wrong there. Now you just need to get it on your list to Santa. Metro threads are currently priced at 2.25 for the big spools and .75 for the mini spools. Check out the package deals they have. And check out the varigated threads that are .99 each spool. They also have bobbin thread. Before you put in your order make sure you check out their coupon area. You can get a 10% savings on an order 99.00 or more, HOWEVER, make sure you see the small print on the two items that it does not apply too! Oh and by the way, if you click on the BLOG on their main page, yup you got it you come directly to “Clicketyclak”, so check them out and check me out as well. Add your name to being a FAN in the upper right hand corner. For the past week I have been working on making daisies and asters from the Dakota Collectable Decor Design set – 970384. The package is called Flower Creations. I’ve always wanted to try my hand at making flowers with the embroidery machine and see how they turn out. I acquired the CD from SewforLess, which by the way is currently on sale for 34.99. The CD consists of 26 designs to make four different types of flowers, daisies, asters, pansies and one other flower. Included in the CD are 6 gift tags. Perfect item if you like to personalize your gifts to family and friends. On the CD you get full instructions of how to put the flowers together using wire and floral wrapping tape. Of course additional materials are needed to complete the project. It is very simple and easy for those beginners out there. I don’t consider myself a beginner, but I’ve worked with floral tape in the past and once I got the momentum going I was whizzing through them quickly. When I decided to make these flowers, I thought I would try a new stabilizer, as my supply is running low. And you say what Donna is going to change her brand, thats not like her. I went ahead and got a sample package of Wunderstitch from SewforLess’ site. The sample package includes 20 sheets of 9 various stabilizers, which include some of the following; medium, heavy soft tearaway, medium cutawy, tear and wash and sew and wash. Would also like to indicate that this package is on sale on the SweforLess site at 26.24, almost half price and it includes free needles. Since I had some sew and wash from another company, figured I would do a comparison between the two stabilizers. When I started my first daisy on my off brand, noted that one layer of stabilizer was not going to do. Sometimes with the density of the item, you sometimes need 2 or 3 layers. So I trashed the first daisy that screwed up and doubled up on the stabilizer. Did several flowers with the off brand and then the remaining flowers I used the Wunderstitch Sew and Wash, otherwise know as Aqua Lace. I noticed that the off brand was thinner or weight was lighter than the Wunderstitch. When I dissolved the items I even noticed that the Wunderstitch was different in weight, it was heavier, only one sheet necessary. I even accidentally left a set of flowers outside on the table, as I was drying them faster in the heat, forgot to bring them in, rained overnight, still had plenty of body in the flower. Starting out the project did lots of flower pieces. Yes that’s right LOTS!!! My daughter saw what I as going to be doing and said, hey Mom can you do pink daisies for Kim, her friend. I said sure what the heck. So I gave her my container of pink threads from Metro Embroidery and said pick. LOL was that a mistake, not really as she picked out three colors. The mistake was me doing 4 of each color! What was I thinking? So pretty much 2 days later I had all my leaves and petals done. It pays to always have a second hoop on items that you are doing a lot of, worth the investment. After all the items were sewn, I trimmed the wash away stabilizer from the sewn pieces. I like to trim a lot of the excess because the water doesn’t get sticky/icky quickly. Say that three times fast! I put the pieces into a plastic container of warm water. Watched the stabilizer dissolve and then shook them to get more of the water off. Took them outside on the patio table to dry. As they were drying, took out the wire and floral tape. Originally was going to buy the wire that had the floral taped on it, but it was going to have to be wrap all together, so nixed that short-cut. In the beginning I cut the wire for the leaves and then wrapped the floral tape on the wire. Big mistake as I realized later, faster and easier to tape the wire and then cut to your size needed for the leaves. But them again, I don’t follow directions unless needed, rolling eyes! Once all the wire was done and the sewn items were dry, I glued the wire and leaves together using tacky glue. While those items were drying started wiring the petals. Two sets of petals per each wire. Placed a dab of tacky glue between the two petals so they wouldn’t move. Waiting for everything to dry. Now to put together. Started wrapping the floral tape to the stem of the flower and made sure it was at the base of the flower. Took one of the leaves and bent the wire and wrapped the floral tape around and continued to bring the tape downwards until I knew where I wanted to place my next leaf. Bent wire, wrapped, brought tape down and placed another leaf. When all the leaves were in place continued to wrap the floral tape all the way to the bottom. I dabbed some tacky glue on the underneath side of the petals. To hide the wire on the daisies I purchased some itsy bitsy pom-poms. Now do you think they would sell a package of just yellow ones. NOOOOOOOOO, what to do as my flowers were pink and the contrasting colors in the petals were yellow. My daughter suggested to dye the pom-poms. Please I am not going to buy a package of dye for 12 itsy bitsy pom-poms!!! So took food coloring dye. They aren’t exactly bright yellow, but they aren’t white either. I was happy with the result. Took a dab of tacky glue and put the pom-pom to the petals. Project done! I was impressed that I decided to make a bunch of asters, in different bright colors of course. Again I made 4 of each color. When making the asters I thought of my sister Susan’s purple room where her Mad Cow painting hangs. The painting contains purples, blues, yellow, orange and greens. Went through the whole process and the flowers look great. Going to take a bunch of the flowers up to Susan and then she can find a vase to put them in. When I was completed, my daughter liked them so much she asked if I would do more but in her favorite colors from bands, uhm okay black and red, whatever. Planning on doing some more daisies in white and yellow! Do I need to say more visit here. I received my package of Metro Thread last week. I am very pleased with the colors and their customer service is great. I had called and requested additional spools of thread. Max was able to add it to my original order. He even popped in a color chart for free. That’s what I call service. Recently they had a 10% off on their thread orders of $50 or more, this promotion ended on April 28th, however I believe they have a promotion still running on orders of $300 and up with a savings of 12%. There is no cut-off date on the site, but follow this link. They have expanded their website recently. One of the new items is a free download of Metro Color Match Software. It works like My Thread Box (which they sell for 79.95), but it matchs Metro Threads to other popular embroidery threads. You can download the software from their home page or from here. Another new section is the classifieds. You can place an Ad for FREE, however you need to sign up as a member. Some of the following categories are: Embroidery Machines; new and used, Embroidery Accessories, and Blanks. So if you have a website, you can post here and if you have a machine that you are wishing to sell, why not here. There is Custom Embroidery and Digitizing Services. Do you digitlize? Just think of the possible sales you can get by advertising here. There aren’t many items in the classifieds as it is new, but won’t hurt to check it out. Heck, I’m gonna post my etsy site there for possible custom embroidery items. Exposure! Then they have a Digitizing Software that they sell, they have a download DEMO, check it out here. So check out Metro’s updated site. And don’t forget, their threads, big king cones are 2.25 each! Letting you all know that as of Friday, April 3rd, Metro Embroidery Thread will be raising their sale prices from 1.89 back to either 2.25 or 2.50. They are not sure what the price will be. They indicated that a shipment just came in and that the threads that weren’t available should be now. I am was going to order a set, but I did calculations and it was cheaper for me to order 16 big poly spools at 30.24 and pay the shipping of 10 bucks. Their 20 poly big spool set goes for 45, but that includes shipping. Where I didn’t need a few of the spools I was able to custom my order. Go to my sidebar and click on their link.